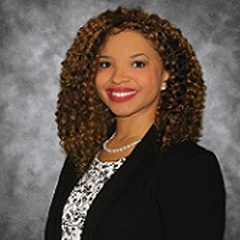 Dr. Candace Giles is a board-certified psychiatrist who joined Georgia Behavioral Health Professionals, in August 2018. Dr. Giles considers herself as a highly motivated, dedicated, and organized psychiatrist who enjoys working with others to provide the best care for her patients using a biopsychosocial approach. She specializes in seeing children and adolescents who are struggling with Depression, Anxiety, ADHD, Bipolar disorder, Schizophrenia, and several other disorders. She earned her Bachelor's degree from Emory University. Dr. Giles furthered her education and earned a Doctor of Medicine degree from Howard University College of Medicine, in May 2012. She completed her General Psychiatry Residency at Jackson Memorial Hospital, her Child Psychiatry Fellowship at Johns Hopkins Hospital, and her Forensic Psychiatry Fellowship at Emory University. Dr. Giles has also served as a Session Moderator for the APA annual meeting, was a mentee in the APA Summer Mentoring Program, and was an Instructor in Emory University's Summer Science Academy. Dr. Giles has also published two articles and given four mulit-discplinary conference presentations. Dr. Giles is board-certified in Adult, Child & Adolescent Psychiatry. She is a member of the following affiliations: American Psychiatric Association (APA), American Association of Child and Adolescent Psychiatry (AACAP), and the American Academy of Psychiatry and Law (AAPL).